” Two years on from our launch and our mission hasn’t changed. We want to help Savour your Sunday. We jiggle at the thought of pottering around home eating croissants and sipping coffee, and make our pyjamas for that special occasion”. Initially Poplin and Bodas’ PJ were one of brand’s best-sellers, but as the prints are quite unique and the collections are growing, you will be truly spoilt for choice. All of the prints are hand-painted, inspired by places that Molly & Joel have travelled to, so they all have a little story of their own. It also means that the print you buy is truly unique – you won’t find it popping up on another brands garments, as can sometimes be the case when items are made from stock fabrics. For those of you that like brand updates, Desmond & Dempsey have two helpful newsletter options. There is a weekly update from their studio with the news (new styles, new stock, the odd cheeky sale). The second one is more like a personal note from either Joel or Molly on the first Sunday of every month, just keeping you in the loop of their pyjama world. In September Molly & Joel also launched a new collection, named Long Tales, which was inspired by tales of the East. It also became a little milestone for the brand, as it represented the last series of prints that were hand-painted exclusively by Christian (Joel’s brother), who now has a new creative partner, called Alice. This year the brand also expanded to offer men’s pjs in a variety of styles – you have long sleeved tops, long PJ pants or shorts, as well as espadrille-style slippers. For women you can choose from long PJ pants, shorts, long-sleeved tops, nighties and nightshirts, as well as recently launched cotton robes. Fancy a special Xmas treat? Check out their silk & cotton pj set. All women’s PJs come in a variety of sizes, from XS to XL, but if you aren’t sure what size to choose, just e-mail customer services and you will get helpful advice. What I also like are the small details – for example the shorts have a drawstring, as well as elastic, so you can tighten them up a little bit, if you want a more snug fit. It is also worth remembering that nightwear as outwear has been a trend since 2008, according to a BoF report: ‘The nightwear-as-daywear trend first hit the catwalk back in September of 2008 at Dolce & Gabbana’s Spring/Summer 2009 show. By 2011, pyjama dressing was everywhere, from Céline to Thakoon. But the trend seemed to truly reach its zenith for the Autumn/Winter 2013 season, when the designer Marc Jacobs referenced pyjamas at his eponymous main line, his diffusion line and Louis Vuitton (where he was creative director), wearing a different pair of pyjamas for his bow at the end of each show’. This effect doesn’t seem to be subsiding and in the spring or summer, when it becomes a bit warmer, I easily wear my Desmond and Dempsey PJ top with jeans and feel very chic and at ease with myself, even when attending my work meetings. 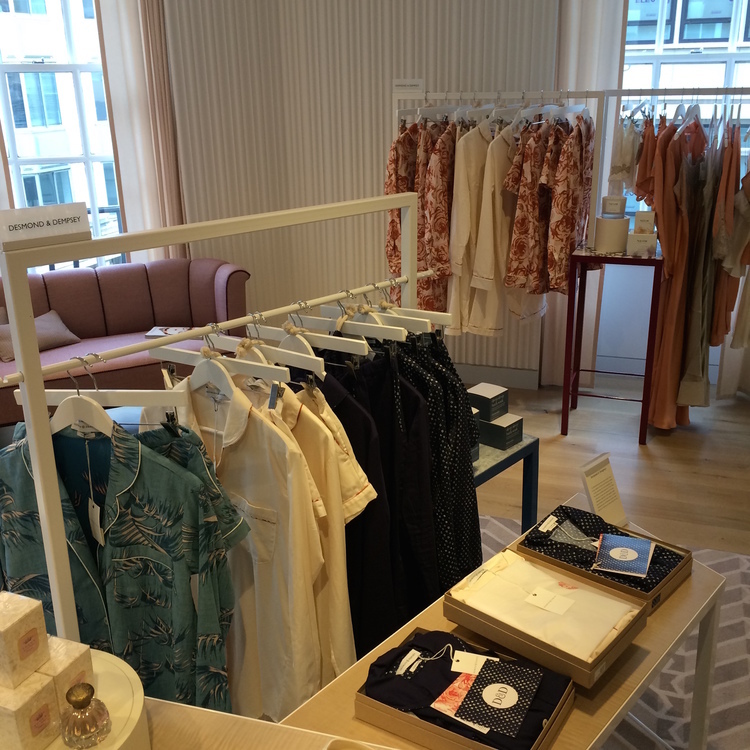 No wonder that in Selfridge’s Body Studio, that opened earlier this year, nightwear plays one of the main ‘strings’ and Desmond & Dempsey continue to offer an accessible luxury price point, especially when you can buy pieces separately or grab an occasional bargain in their sale. They also offer personalised monogramming service. For those of you who like to extend your cosy home comforts, there are now eye-masks ( you have a choice of 11 prints ), as well as two sizes of candles, in 120 mls & 500 ml sizes, with scents like rosemary & watermelon, white jasmine & fresh linen. All you need to do is choose the pjs, light a candle and get cosy with a book, in front of TV or simply in bed, after a relaxing bath, leaving the worries of the day behind and enjoying the simple comforts of life that are a so precious and so needed in order to achieve balance.